Preheat the oven to 400 F (200 C). 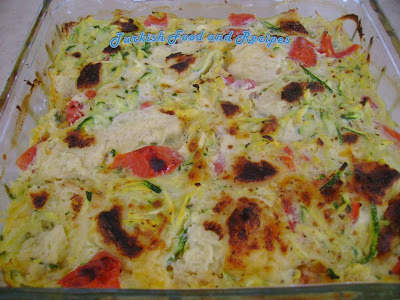 Take grated zucchini into a Pyrex dish and salt. Place the bread pieces all over. In a bowl, whisk egg and milk then, stir in basil and cheddar/mozzarella. Pour this mixture over zucchini and bread pieces. Mix them all up. Finally, place tomatoes on the surface and sprinkle grated Parmesan all over if desired. Bake for about 30-45 minutes till it gets light brown. Firini onceden 200 C (400 F)’ye isitin. Borcam bir tepsiye rendelenmis kabagi alin ve tuzlayin. Uzerine ekmek parcalarini serpistirin. Bir kasede sut, yumurta, kasar peyniri ve feslegeni karistirin. Borcamdaki kabaklarin uzerine dokun ve hepsini harmanlayin. Son olarak domatesleri esit olarak uzerine yerlestirin. Istege bagli olarak Parmesan peyniri serpistirerek firina verin. Yaklasik 30-45 dakika, uzeri hafifce kizarana dek pisirin. My family loves LOVES this recipe! Thank you so much! 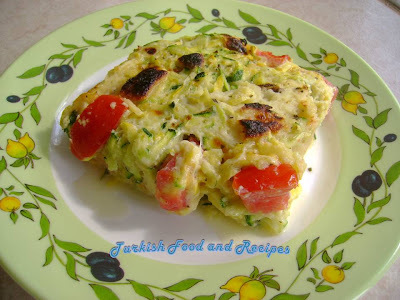 I have just found the joy of Turkish cooking, and I'm addicted! Simply delicious!